Two days punishing our bodies on the exhilarating slopes at Taos ski village. Another day traversing the Rio Grande Gorge from Pilar to the Gorge Bridge on mountain bikes. Nearly 40 miles for a round-trip of muscle-straining cycling. And finally, a day of white-water rafting the Rio Grande from Razorblades to The Box to to The Racecourse. We’d taken our minds and bodies past the point of no return, and finding a way to refresh our souls and process our experiences had become priority number one. 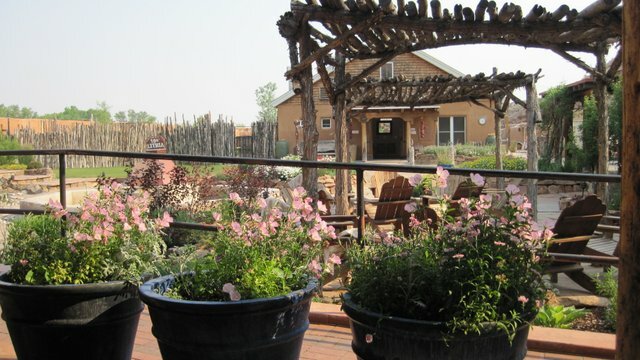 Before we’d booked our trip to New Mexico, Matt Gontram, the owner of New Mexico River Adventures, recommended we stay at Ojo Caliente after our week of skiing, biking, and rafting. He tried to emphasize how important it would be to relax after such a trip, and he stressed that the arid grandeur of Ojo would be just what we needed after such a physically demanding vacation. My wife and I had never stayed at a spa like Ojo, but we took his advice and hesitantly booked our stay, not knowing what to expect. When we finally arrived at Ojo, exhausted from our adventures, we were eager to rejuvenate our minds and bodies. We wandered into the lobby, dusty and dirty, two weary souls in need of solace. The wonderful folks at the front desk greeted us warmly, and they pointed us toward our room. As anyone who has ever had the distinct pleasure of staying at Ojo can probably attest, simply walking onto the gorgeous property sets the mind at ease. The landscaping. The beautiful New Mexico flora. The remote location. The whole ambience of Ojo Caliente simply encourages peaceful contemplation, and as we walked through the property, marveling at the various hot springs fed pools and the luxury that awaited us, any lingering doubts about our stay vanished. We dropped our things off in our spacious and homey room and, like most people, immediately headed off to the mud bath. 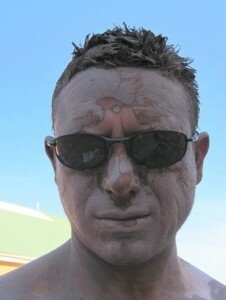 How to describe the sensation of bathing in mud? Imagine slathering yourself with a velvety, satiny, substance that feels like liquid chocolate, and you might get close to the feeling of scooping handfuls of red mud onto your body at the mud pool at Ojo Caliente. The viscous liquid envelopes your body like a lover, holding you close and keeping you warm. Lie back on a reclining chair and let the warm, New Mexico sun bake and harden the mud onto your body, pulling your skin taught in the process. The mud will tighten on your skin, causing a child-like playfulness in even the dourest personality. You can’t help but smile at the feeling created by the mud hardening on your face, and each time you smile, the mud cracks a bit more, which in turn, makes you smile even more. When we’d booked our stay, we’d also included a massage, and my wife pointed out that we were in danger of missing our appointment. So we reluctantly rinsed off and left the luxuriousness of the mud bath and headed to the masseuses. For nearly an hour, two talented masseuses massaged and manipulated our tired muscles with their slippery, strong fingers, loosening knots and relaxing our tired bodies. 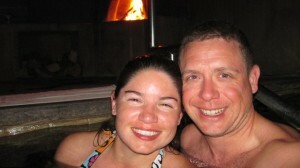 We ended our night in one of the private baths. As my wife and I sank into the warm, spring-fed waters, our private and enclosed bathing area illuminated by the dancing flames of a log fire in our mini kiva, we held each other and watched the moon rise from behind the cliff-face. All the tension in our muscles had vanished as if by magic, and our spirits had also calmed from the excitement of the past week of adventures. We’ve been back to Ojo Caliente many times since then, but that first trip was revelatory and truly magical. 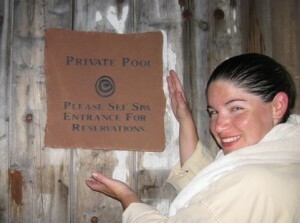 The warm waters of the springs, the luxurious mud bath, the deft fingers of the masseuses, and the intimacy of the private bath provided my wife and I with the opportunity to calm our souls and reconnect with one another intimately and spiritually.